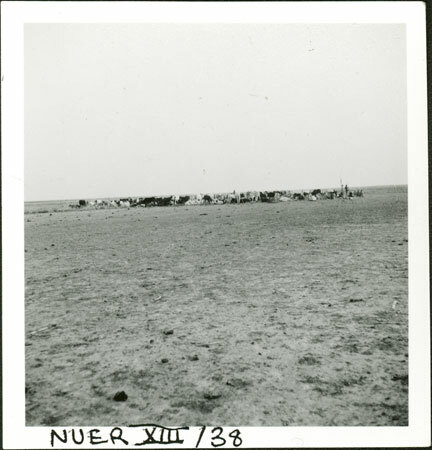 A slightly distant view of a herd of cattle comprising a cattle camp, set in a wide expanse of treeless grass savannah in western Nuerland. It is probable that this is a very early dry season camp without huts being made, which fits with Evans-Pritchard's 1936 fieldwork which straddled the end of the rains with the beginning of the dry season. This may relate to the early November camp from Nyueny village described by Evans-Pritchard in one of his articles. Note on print reverse ms pencil - "6 W.Nuer" & print front border ms ink - "NUER XIII/38"
Morton, Chris. "Nuer cattle camp" Southern Sudan Project (in development). 03 Jan. 2006. Pitt Rivers Museum. <http://southernsudan.prm.ox.ac.uk/details/1998.355.619.2/>.